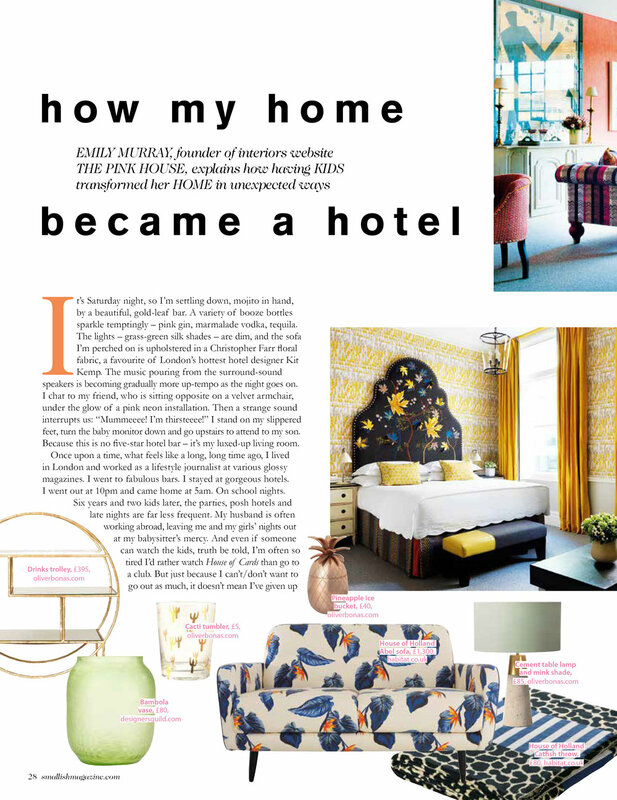 I'm the founder/editor of award-winning interiors blog The Pink House. I've spent 10 years (give or take the odd maternity leave) as a lifestyle journalist and editor (Grazia, Glamour, Stylist, The Guardian, Conde Nast Traveller, Cosmopolitan, Mother & Baby, etc), and before that I worked in advertising. Just before setting up The Pink House I worked for a year as Editorial Director for PR company Stripe Communications. I recently finished a stint as acting Editor at i-on (Scotland’s largest lifestyle magazine, circulation 40,000), where I now write an interiors column. I used to jump off buildings and do backflips for cash, but that's another story. What is The Pink House? I launched The Pink House - 'fabulous family living, despite the kids' - on 29 February 2016, combining inspirational interiors, travel & lifestyle content with entertaining writing and beautiful photography. In 2017 The Pink House won the prestigious Amara Interior Blog Awards 'Best Written Blog' award. The Pink House won 'Best Newcomer' in the same awards in 2016. I will be a judge at the 2018 Amara IBA awards. In 2017 The Pink House's fast-growing Instagram account @pinkhouseliving (current following: more than 51,000) was selected as one of Sheerluxe's Best Interiors Instagram Accounts. The Pink House's Pinterest page receives more than 1 million views every month. The Pink House won the 'Best Wow Factor Interior' award at Pinterest's inaugural Interior Awards this year. The Pink House is a registered trademark, and a limited company, of which I am the Director. 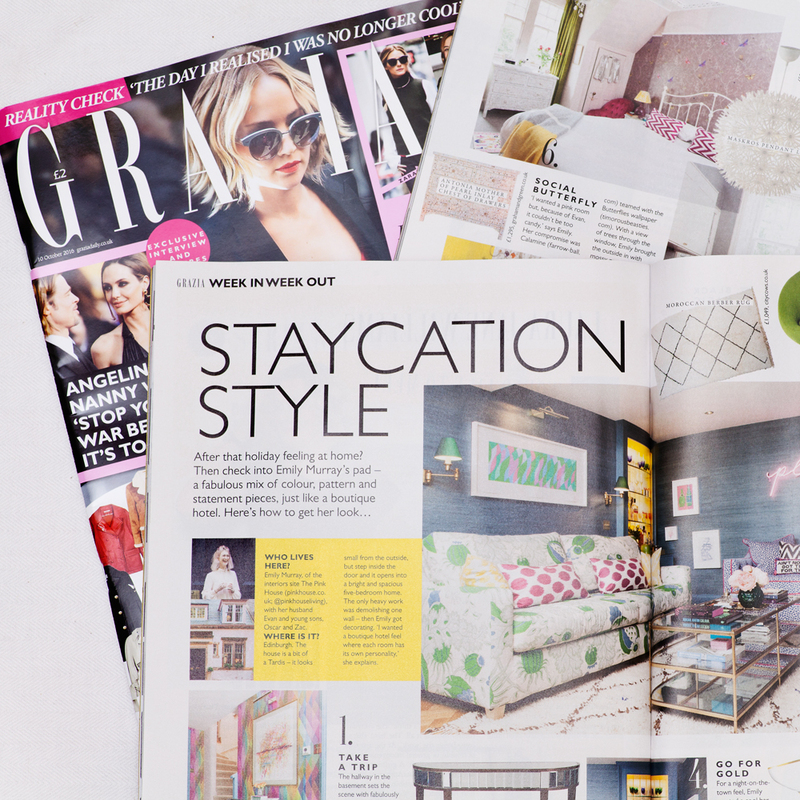 For The Pink House's press coverage (which includes Grazia, Glamour, The Times, Good Homes and Apartment Therapy), click HERE. 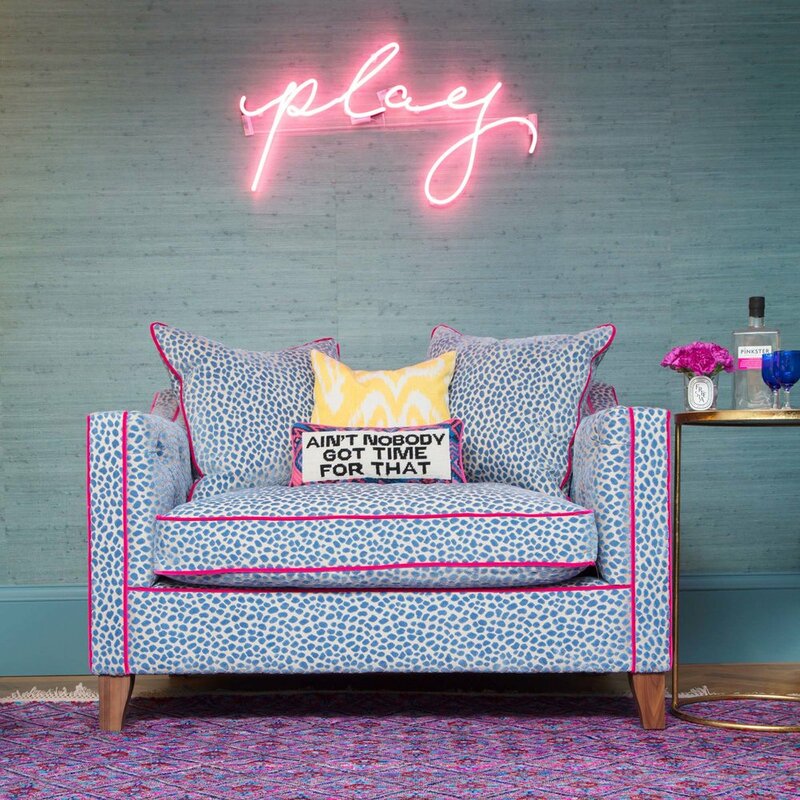 I also offer a styling/design service - for example, I designed the personal shopping area and bar in River Island's Oxford Street flagship store, and styled a room set at the entrance of last year's House & Garden Festival in London Olympia. I take on the occasional interior design client. I love working with brands to create compelling, beautifully written and photographed content. I write posts my style-savvy readers love, while subtly explaining the benefits of your brand. My preferred platforms are my blog and my Instagram account @pinkhouseliving. Brands I have worked with include: Marks & Spencer, QVC, La Redoute, River Island, Amara, B&Q, Primark and Jacob's Creek. Whatever size of campaign you’re after - from one Instagram photo or one blog post, to a year-long partnership - if your brand is a good fit with The Pink House, I can help. I am an experienced speaker at events and workshops, (most recently at Esquire Self-Made) and am comfortable in front of a camera, whether on Instagram Stories, or performing a script for a brand video, watched by millions (Marks & Spencer, B&Q). I work with selected travel brands, reviewing luxury accommodation and experiences, in both family and kid-free contexts. I'm currently brand ambassador for Mark Warner holidays. I work with The Pink House's very own top interiors photographer Susie Lowe to offer a full professional photography service, where required.